Two years ago we blogged about some of the nicest terraces to drop in on for a drink in the sun (that post is here). But with this sudden bout of lovely weather, we are once again inspired to grab our friends and head for the nearest terrace. So here is another list. This list, however, will focus on terraces away from the center of Amsterdam, away from the crush, away from the hoardes of tourists. Pick any one of these terraces to get a true taste of how the Amsterdammers do it in the sun. Restaurant As- We here at Hotel V make no secret of the fact that we are crazy in love with Restaurant As. The simple, whole foods method of cuisine, the wonderful building, the friendly staff- really, what’s not to love? And add to all of that, they have a lovely shady terrace surrounded by leafy trees. Perfect for when you want to terrace lounge but aren’t the biggest sun-bunny out there. Panama: Temporarily closed, Panama is now once again open and under new management by the IQ-Creative family (Supperclub, Nevy, Envy, Nomad’s, etc). There are precious few other places in Amsterdam where you can start with sitting in the sun on a terrace, and end with dancing until 4 am in the Panama club. And doesn’t that just scream summer to you? Enjoying a lovely warm evening until the very next morning? Amstelhaven: A tiny, funny little terrace smack-dab next to the water of the Amstel River, the Amstelhaven is a perfect pull-up spot if you are cruising on your boat (lucky you!) and want to pull in somewhere (but please don’t drink and sail!). The interior of this lounge is actually situated under the road- all in all a funny but chill little place. 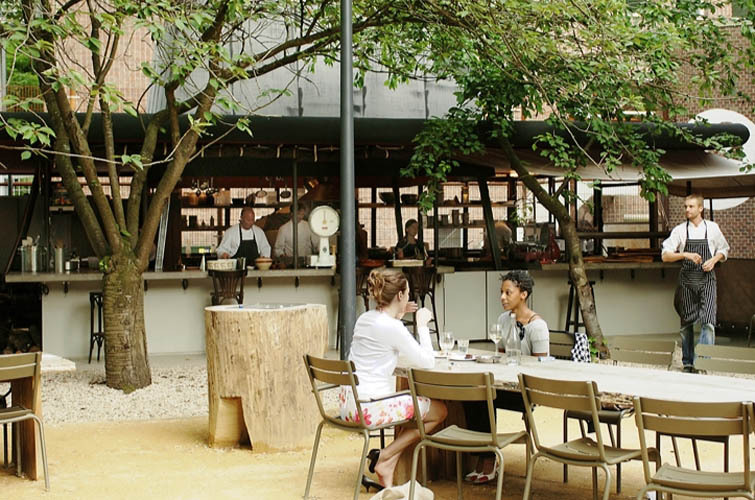 Roest: As it says on their website, “Amsterdam Roest is a city oasis…a creative free spot”. Quirky, lovely, and very well hidden in the East (my friend had to practically take me by the hand and guide me there through the industrial wasteland when we went last weekend). Only open for just a year, I’m just sorry that I hadn’t bothered to seek it out earlier. Hard to describe, but lovely to behold. They have a wide terrace with a sandy faux-beach facing what appears to be a quiet former harbor canal. For parents there is even a playground for your little ones- hip fun for the whole family! Barça: Voted as one of the best terraces in Amsterdam in 2011, Barça is a lovely place to go for an after-work drink, a warming-up-for-the-night drink, or even a final destination to party. Located in De Pijp on the Heinekenplein, you get the bustle of the city at a close distance, and either sun or shade depending on where you sit on the terrace. So perfect win. Noorderlicht: At some point this summer, if the crush of the city is getting too much for you, hop on a ferry to the North of Amsterdam and make a pitstop at Noorderlicht to recharge your senses. Feeling more like a cafe nestled on a hippie commune, the Noorderlicht will give you that peace of mind that you crave. But don’t underestimate it here- with a program of parties and live music throughout the summer, this is still a party place to be reckoned with. Eye Film Institute: While you are up in the North of Amsterdam, it might be worthwhile to check out the terrace on the new Eye Film Institute. I can’t promise that it won’t be chock-a-block busy or free from tourists, as it is Amsterdam’s newest “feature”, but with a terrace overlooking the city from north of the Ij, it will give you quite a view with your drink. 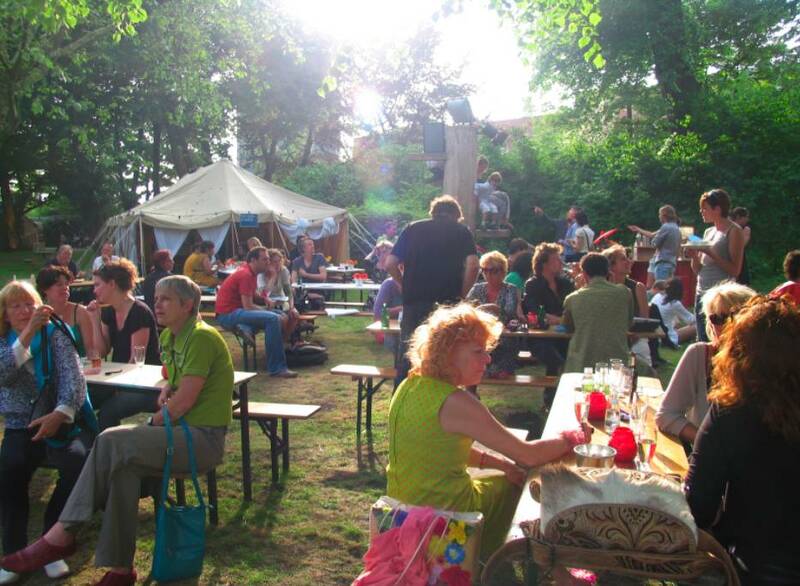 Het Tolhuis: Since you’re up in the North anyway, why not also stop by Het Tolhuistuin. As you can see in this painting from Nicolaas van der Waay from 1891, this place has long been in the heart of Amsterdammers (actually since 1660!). So rock it like it’s 1891, and have a drink in a lovely grassy garden while contemplating the generations that this place has seen come and go. Deep, man…Deep. And if that is more deep thinking than you are inclined to do, then just enjoy the summer agenda that they will inevitably have on- a mix of arts, music, and collaborative projects with their partners. This place always has an easy-going festival atmosphere. The Harbour Club: New to Amsterdam (just opened this month in Zeeburg), the Harbour Club is meant to bring a little chicness to your terrace lounging. With sister locations in Rotterdam and Scheveningen, this is the place to go if you like a little “See and Be Seen” with your sun baking. De Ysbreeker: Named after the kind of boat that can break its way through thick ice, De Iysbreeker is therefore kind of an ironic place to grab some sunshine, but there you go. 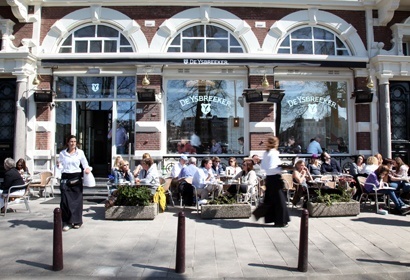 Located along the Amstel River, the terrace is split into two- one part on the sidewalk by the entrance to the cafe, and one part across the street closer to the water of the Amstel. Always busy, but the service is thankfully quick, and the menu very diverse. Hanneke’s Boom: Located at the previous spot of one of the tollgates leading into Amsterdam, Hanneke’s Boom has a history that dates back to 1662. Since reopening as a cafe-bar last year, it is quickly building up an even more legendary reputation in Amsterdam- and it’s lovely secluded terrace overlooking the NEMO adds to that allure. Built like a slap-up shack (an ode to the log toll house that used to stand on that very spot), Hanneke’s Boom gives you the feeling that anything goes. Sort of like speak-easy-meets-back-water-bayou, if you can imagine such a mashup. Brouwerij ‘t Ij: Last but not least, to remind yourself that you are in the Netherlands, why not have a drink on the always bustling terrace of Brouwerij ‘t Ij in the East under the shade of one of the few windmills left in the city. The novelty here (besides, of course, the windmill) is the fact that your beer will travel a maximum of 15 meters during its lifetime before ending up in your belly, as this is the actual brewery location too, with a pretty extensive list of home brews. We hear that today is going to be 27 degrees and sunny. So grab a friend, pick one of the above terraces, and live the good life. And if you do, let us know what you think!